• Price: Minimum payment of $200 for the first 8 climbers. Each additional participant is an added $25, up to 25 participants. You may have less than 8 participants; however, you will still be charged the minimum amount. • Climbing: Our staff will guide your climbers around the gym for 1.5 hours of climbing, taking care of all the belaying for the group. We have a 1:4 ratio of staff to climbers, so everyone will have plenty of time to climb. 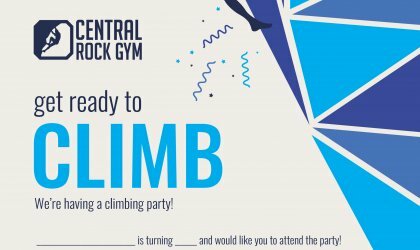 Bouldering is not included before, during, or after the party. • Reservations: Parties must be booked at least 2 weeks prior to your requested date and time. Any events requested less than 2 weeks before the intended date will need to work directly with the event coordinator to see if staff can be found on short notice. We provide all paper/plastic goods needed (plates, cups, eating utensils, napkins) a cake knife, candles, lighter, fridge/freezer, tables, and chairs. • Food: Food and drinks are not provided by the facility, but Peppino’s Pizza delivers to our facility. Hosts can give their pizza order to our desk staff when they first arrive so it can be delivered hot and fresh right when the climbers are finishing up their time on the walls. • Party Favors: The birthday child gets a FREE birthday t-shirt. Other participants can purchase a t-shirt the day of the event at an additional cost.